Hair loss can be triggered by a range of chronic medical conditions, but one of the stealthiest is anaemia. This is because the other symptoms of anaemia can leave you in a state where it's hard to keep track of what's happening to your hair. They can also be mistaken for Symptoms Of Stress. As well as interfering with hair growth directly, anaemia is thought to trigger other types of hair loss condition. Anaemia is a condition in which your red blood cells are not able to do their job properly. Sometimes this is because there are not enough of them and sometimes it's because they're not working properly. The job of red blood cells is to deliver nutrients and energy to all the different cells in your body. Iron Deficiency Anaemia – if the body is not getting enough iron, not enough red blood cells can be made. Women are more vulnerable to this type of anaemia because they may lose iron during menstruation or Pregnancy. Eat leafy green vegetables or red meat to boost iron levels. Iron supplements can be dangerous so don't take them without medical supervision. Vitamin B12 Deficiency (pernicious anaemia) – if your body doesn't have enough vitamin B12, it won't be able to absorb iron properly. Men are more vulnerable to genetic disorders which can interfere with B12 levels. Treat it by eating mushrooms, marmite and dairy products, or fortified breakfast cereals. Copper Toxicity Anaemia – if your body contains too much copper, it may be unable to properly store and distribute iron. Taking some medication, Smoking, or eating a diet too high in protein can cause this. To treat it, get plenty of exercise and ask your doctor for advice about changing your diet. Nucleated Red Blood Cells – red blood cells differ from other types of cell in that their nuclei – their 'brains' – are removed by the spleen. This means they have more room to carry oxygen. Injury to the spleen can leave it unable to do this job. This condition cannot be cured but a healthy lifestyle can mitigate its effects. How do you know if you have anaemia? Whatever type you suffer from, you are likely to have some of the same symptoms: tiredness, lack of stamina, dizziness and headaches. You may feel irritable or depressed, and you may struggle to concentrate. Sometimes people with anaemia experience fast or irregular heartbeats and chest pains or shortness of breath. Even non-clinical anaemia, where iron levels are low but tests still look okay, can cause hair problems. 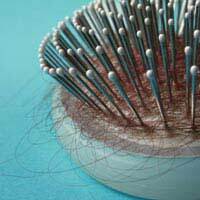 All forms of hair loss caused or triggered by anaemia are diffuse. This means that your hair will gradually thin across your scalp, rather than coming out in patches. You may find more hair coming out in the shower or on your hairbrush. You may also notice the presence of thin, pale hairs mixed in with the rest of your hair. These are more delicate than the grey or white hairs caused by ageing. How Does Anaemia Affect Hair? There are several ways in which anaemia can affect your hair. First of all, it's important to recognise that, however much you value your hair, it's less important to your body than, say, healthy internal organs. This means that if your body doesn't have adequate nutrition, your hair will usually be the first thing to go. Don't feel envious of unhealthy people with beautiful hair because their bodies have probably made the wrong 'decision', resulting in damage elsewhere. Hair follicles need iron in order to produce a protein called ferritin. The job done by ferritin can be interfered with by stray copper molecules, so either too little iron or too much copper can interfere directly with hair production. This means that some follicles will stop working and others will produce those thin, pale hairs. If you already have another hair loss condition (even if you are too young to have noticed), anaemia may cause it to develop more rapidly. This is a particular issue with telogen effluvium. Treating your anaemia will not be able to cure this kind of hair loss condition but it will be able to slow it down. The good news is that if your hair loss is caused entirely be treatable anaemia, it should be possible for you to get those follicles working again and make a complete recovery (though it can take some weeks for healthy hair to start growing again). If you suspect you have anaemia, always talk to your doctor. As so often, problems with your hair can be a tip-off about deeper problems with your health.